This is what the go kart looked like after the restoration. I added red stripes around the wheels, hubs, red seat piping, and red engine shroud. I fixed up the briggs 5 hp flathead engine on it and it provided plenty of power. Boa noite Quais são as medidas do chassi do kart ?? just wondering if it would be possible to let me know what colour orange you used on this go kart. A code/number would help, but thanks anyway. I’m repainting my Manco Dingo, so and was quite liking this colour scheme, just asking. HB, IIRC i use the rust-o-leum spray paint, specifically the professional High Performance Protective Enamel if you are looking at red, it comes in either dark red or the brighter red IIRC its safety red. affordablegokarts (just google it) he used to sell them back in the day and bought out a bunch of parts when they tanked. He can help you out for sure. 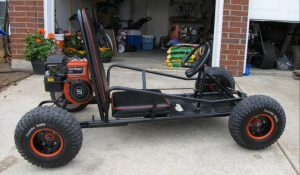 Nope, this is just a picture of a restored kart that I fixed up. If you are looking for an old beater frame, you can check your local online classifieds. I already do. If you subscribe to me on youtube (youtube.com/c/kartfab) you will automatically get updates on my new videos.